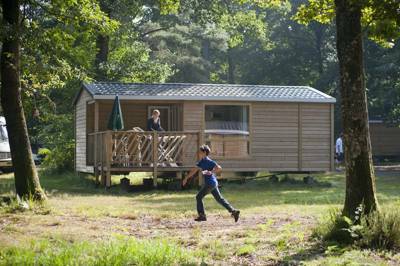 Traditional, natural grass pitch amidst the National Forest suitable for tents, campervans, caravans or motorhomes. Please state the make and size of your tent or equipment in the notes section of the booking form so that we can be sure you have booked the most suitable pitch. 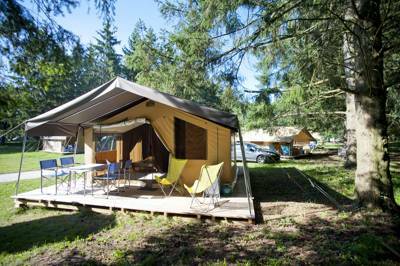 Cute canvas tent boasting pleasant living area, kitchenette and bunk beds for the children. Cosy wooden cottage with all mod cons. Spacious safari tent with private bathroom and kitchen. Huttopia Lac de Sillé Campsite isn’t exactly small. There are over 150 pitches in total. Yet you could be forgiven for thinking it’s almost half that size. After all it is completely dwarfed by its surroundings. The forest around spreads for over 3,500 hectares and, just a few yards away, a huge lake in the shape of a teardrop glistens in the sun. It’s creatively named ‘Le Grand Étang’, literally meaning ‘the big lake’. Pitches vary wildly across the site. At its furthest point, where the trees are thickest, there’s a real woodland feel and tents spread among the bows with bicycles leaning idle against the trees. Closer to reception, meanwhile, the space is far more open and generally feels a bit more ‘parky’ with motorhomes and caravans in among the larger family tents. There’s an array of glamping accommodation options – in particular safari tent-style lodges in various sizes – and wooden cabins equipped with everything you could possibly. It’s the activities that this campsite is perhaps most well known for. There’s a whole range possible around the lake, including mountain biking, watersports, swimming, climbing, zip-lines, archery, fishing, and more. Then there are the facilities specific to the campsite itself: ping-pong tables, volleyball courts and bikes available to hire. There’s an indoor area with board games and books in case it rains (though if you’ve headed here from the UK, rain probably isn’t anything to worry about). The focus is definitely on families but if kids and noise all become a bit too much there’s a pleasant 2km walk through the woods to nearby Sillé-le-Guillaume. The tiny town has a sleepy feel but all the French essentials – cute cafés, excellent delicatessens and an old Château. It’s a quiet contrast to the hive that is Huttopia Lac de Sillé. 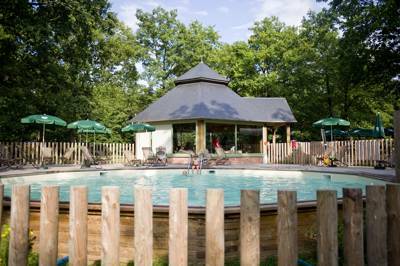 For latest availability and best prices for Huttopia Lac de Sille, please use the Date Search above. 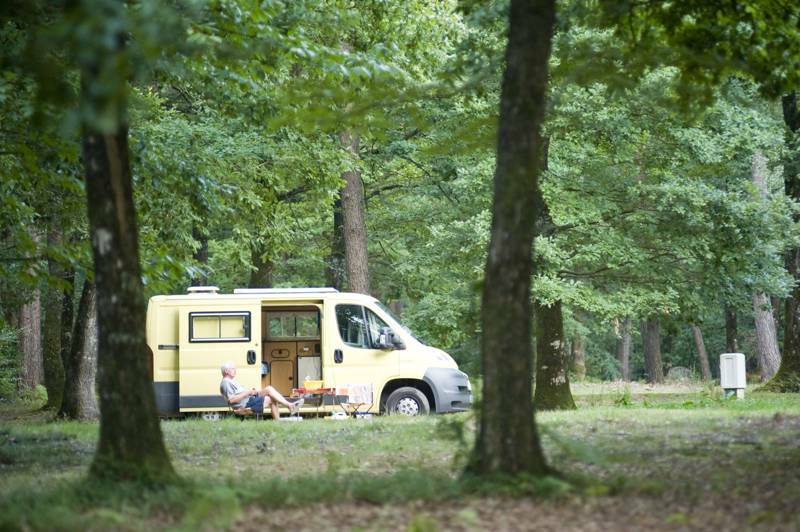 Camping pitches from €19.50 per night, including a pitch, 2 people, a vehicle and a tent or motorhome. Additional adults €4.50–€6.30; children under 4 years old free, and children between 4–10 years are free in low season and €4 in high season. Pets €2.30–€4.50. 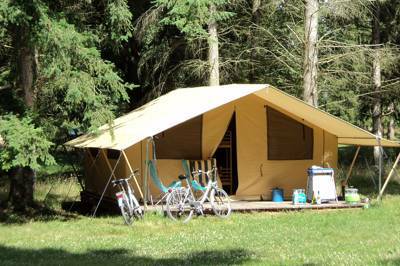 Glamping accommodation begins from €46 per night.